Internationally recognized for his development and certification of aircraft safety and performance improvements, such as jet engine thrust reversers, it’s obvious that not much has “stopped” Howard, who has patents for many inventions and has worked with or mentored some of the most well known names in aviation. In recent years, Howard has been recognized for his accomplishments in several different ways. In November 2000, he was inducted into the Texas Aviation Hall of Fame, of which he currently serves as a member of the board of directors. In March 2002, he received the prestigious Charles Taylor Master Mechanic’s Award from the Federal Aviation Administration, for more than 50 years of dedicated service. In September 2002, at the National Business Aircraft Association Convention in Orlando, Fla., the Nordam Company acknowledged Howard and Etienne Fage for their advancement of jet engine thrust reverser design. They did so by announcing the Nordam Dee Howard/Etienne Fage Scholarship Award, which will be given annually to Embry-Riddle Aeronautical University, of Daytona Beach, Fla. While at the convention, the president of Embry-Riddle asked Howard to speak at the university. Dee Howard’s museum, at his office just west of San Antonio International Airport, displays past accomplishments, as well as some of his vast art collection. In November 2002, Howard arrived at the university as the guest speaker of their Legends in Aviation and Aero Space Distinguished Speaker Series. Howard was born in Los Angeles on May 26, 1920, to a father from Buffalo, N.Y., and a mother from San Antonio, Texas. It wasn’t long before the family moved to the Lone Star State. “I probably wasn’t more than a year old. There’s an old saying that Texas girls always bring who they’ve married back to Texas,” he says with a laugh. Howard’s father was very capable of doing whatever needed to be done, including becoming a well-respected auctioneer. However, Mr. Howard would die before he turned 50, after having a massive stroke. After his father’s stroke, young Howard had to drop out of school to go to work. Howard remembers the hard times that came with the Stock Market Crash in 1929. Of his father, he says he was “a good Christian person with good principles,” who gave him a lot of excellent advice. Throughout his years in research and development, Howard lived by that principle. “I’ve worked with a lot of people who fooled themselves into believing, as the saying goes, ‘When you are hard pressed for an answer, any answer will do.’ I never fell prey to that,” he said. Howard might not have been born in Texas, but having grown up in San Antonio, he is “proud” to think of himself as a Texan. He remembers working during the early recovery years of the Great Depression, in the automobile and trucking industry, and doing different jobs to earn money. Most of the temporary jobs came and went quickly. Howard remembers that his father was a good mechanic. “We grew up around that type of an environment, so taking to the tools was an easy thing for me to do,” he said. Howard remembers that when he was a teenager the WPA was rebuilding the old terminal at Stinson Field, where he hung out. Stinson Field is now the oldest continuous operating airport in the United States. But, when he began seeking employment, a job in aviation wasn’t easy to find. Finally, Howard was able to get on with Braniff Airlines as a baggage handler in San Antonio. True love struck when Howard was still a teenager. At 18, he married 16-year-old Georgiana. When, the war started, Howard decided to take his wife and baby home to Texas. During the war, Howard worked two shifts a day—one for Braniff and one working for himself on private airplanes. The two shifts meant that he sometimes didn’t get much sleep. He also performed maintenance on aircraft, trading work for flying lessons. After the war, he continued flight training to get his twin-engine and other ratings. He loved test flying the private aircraft he worked on, when allowed to do so. Howard found that working for the airlines was a long, slow climb to the top. With the war over in 1946, at the age of 26, he saw his chance to move up the ladder when he joined the newly formed Slick Airways. One of the first post-war all cargo airlines, Slick Airways had 10 new surplus C-46 cargo airplanes, which were public-use military airplanes that needed FAA certification. “I went to work as a mechanic, and wound up in charge of airframe overhaul and modification,” he said. Howard greatly enjoyed working with the engineers to certify the airplanes. That, however, is for later in his history. After the aircraft had been certified, the new cargo airline’s only business was New York to Los Angeles, round trip, so the company relocated to Burbank, Calif. Howard decided to stay in San Antonio and start his own business. “I had saved up a little money, so I built a small building on the ramp, and started Howard Aero, at San Antonio International Airport,” he said. 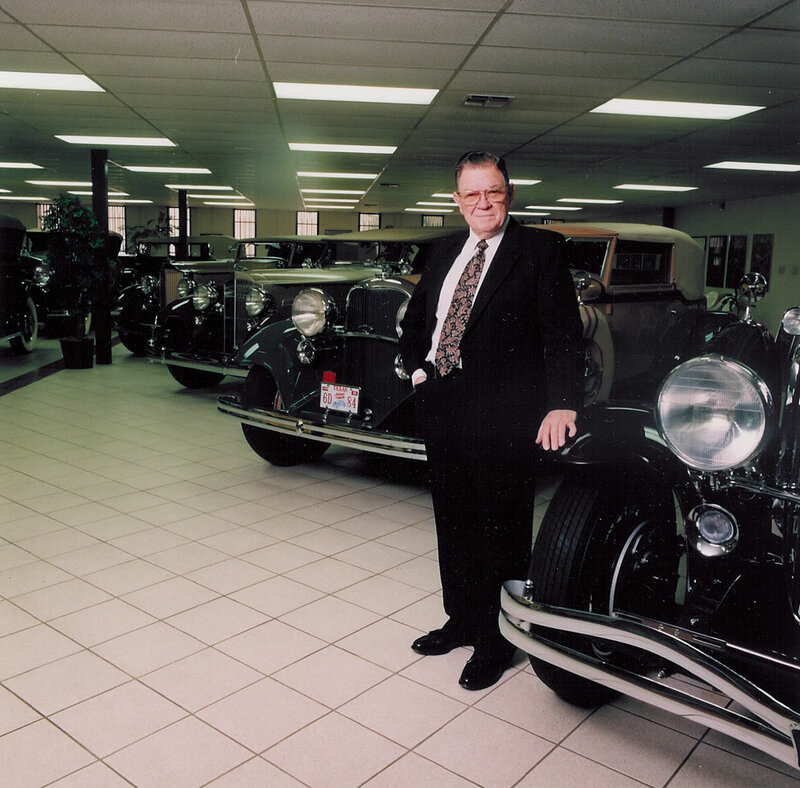 His first employee was Ed Swearingen, who would later go on to live his own success story. Founded in 1947, Howard Aero, Inc. was very successful. But there is a little more to the story than that. 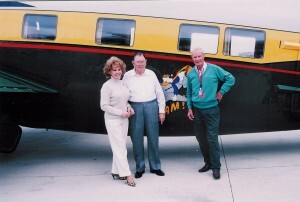 Betty and Dee Howard pose with Elton Rust, president of Million Air San Antonio, in front of a Howard 500 that recently visited the FBO. Rust, a test pilot for Howard, flew as pilot on the flight of the initial Howard 500, with Howard serving as copilot. As the story continues, in Mexico City lived a wealthy businessman and aviation aficionado who loved airplanes and had two A-26s. One day, the pilot of one of the aircraft taxied in and said they knew the “Reynolds Bombshell” was hangared there, and they had hoped to find out where to get dual controls. Howard said he happened to know where they could get some, and they agreed on an installed price and two weeks to complete the work. When the A-26 aircraft were used for carrying passengers, they would bolt the bomb bay doors safely closed so they couldn’t be opened, Howard said. “The cabin entrance door that hinged down from the floor of the cabin had steps on it,” he said. “The passengers would enter the airplane using the steps on the door. Once in the airplane with the door closed, the steps would fold flat, allowing the passengers to move around on top of the door. On this aircraft the door was poorly designed, and dangerous. Out of the favor came a great friendship and the desire for an airplane that the wealthy businessman could stand up and walk around in, which would fly at 300 mph, and make nonstop trips, such as Mexico City to New York. “We looked around and the only airplane that really fit that bill was the Lockheed (PV1) Ventura bomber,” he said. “The Lockheed Lodestar was a passenger-carrying airplane. Lockheed made a medium bomber out of it, for Great Britain, as a sub hunter. When the war started, they didn’t go to Great Britain. They used them elsewhere. They had a large passenger cabin; the baggage compartment under the bottom was where the bomb bays were. The businessman told Howard that he would do a joint venture with him, and was willing to put in three million dollars. And, that’s how Howard got started in the airplane manufacturing business by doing somebody an unexpected favor. Beginning in the early fifties, the manufacturing division of Howard Aero built over 100 Super Venturas. It was a busy and tough time for the rapidly growing company, which had a major crisis when the financial backer of the Super Ventura program was killed in an aircraft accident. The Howard Super Ventura set the pace for high-performance executive aircraft. The Howard 250, 350 and 500 models followed. The Super Ventura and Howard 500 were produced on an assembly line in the same manner that new aircraft are manufactured. The Howard 500 was FAA certified as an all new, pressurized aircraft. The popular Howard-produced aircraft were considered the “class act” for modified post war, high-performance business aircraft. More than 200 of the various models of the Lockheed aircraft were produced and flew with an enviable safety record; not any of the Howard aircraft were ever involved in a passenger fatality. And, the company gained a strong and loyal customer base, which helped in the hard times. Howard became involved with a project that would lead to many others. He became acquainted with Bill Lear through Ed Swearingen, who, at one time or another, worked for both Howard and Lear. “Bill Lear moved to Geneva, Switzerland, with the idea he was going to build the first executive jet business aircraft,” Howard said. In the early sixties, Lear came to San Antonio to have Howard build the mock up of the first Lear Jet for him, with the probability of building the aircraft in San Antonio. On Oct. 7, 1963, the first Lear Jet prototype took off. And, with great respect for each other’s accomplishments, Howard and Lear became good friends. Howard’s personal Lear Jet was in the jet fly over at Lear’s funeral in Reno, Nev., in 1978. With the business aircraft market turning to turban-powered aircraft, it became clear to Howard that his future would be, in some manner, associated with jet-powered aircraft. Hoping to secure the future, he accepted an offer to sell half of the Howard Aero Company to a financial backer. In the deal, all of the investor’s funds would go into the company and Howard would loose voting control until certain milestones were achieved. “I didn’t like the deal, but when you are going over the falls, you will hold your hand out to an alligator,” Howard said. It didn’t take long for Howard to find out that losing control of his company was a bad mistake. At the end of the first year, on Friday the thirteenth, September 1963, he was minus the company he founded, and “rode off into the sunset.” Two years later, the new owners took the company into bankruptcy. 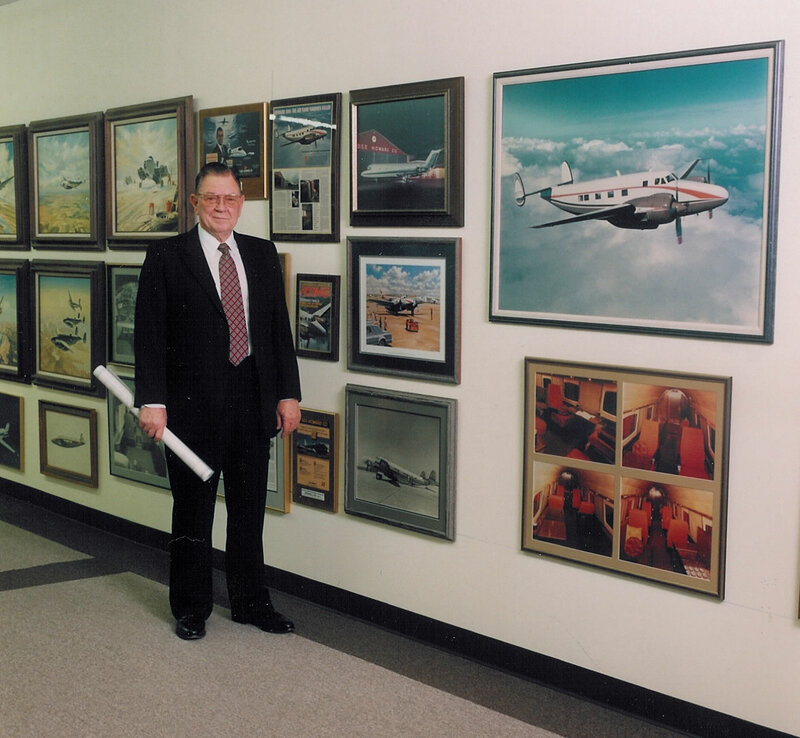 Down but not out, Howard started The Dee Howard Company in 1964, which soon became the industry leader in engineering and production of improvements for the emerging business and commercial jet aircraft market. “I had picked myself up by the bootstraps,” Howard said. The company was responsible for a number of inventions and supplemental type certificates. When the new business jets were first introduced, thrust reversers were not available for the CJ610 GE Jet Engine that was used in the Lear Jets and Jet Commander aircraft that, instead of a thrust reverser, used a drag chute for emergency stopping. That wasn’t, however, a very practical idea. Although some might think that when hard pressed for an answer, any answer will do, Howard chuckles over an even worse scenario. “Sometimes a bad answer is more acceptable than no answer,” he says. Howard decided to do something about the problem. He developed and produced the thrust reverser for the GE CJ-610 jet engine, highly successful from a function and reliability standpoint, which launched The Dee Howard Company into the thrust reverser business. With the introduction of the fan-jet engines for business aviation, Howard entered into a joint venture with a French company that had developed a fan jet engine thrust reverser that was not ready for production. The engineer who was responsible for developing the French thrust reverser was Fage who, with Howard, worked as a team to develop additional technology that advanced fan-jet thrust reverse technology, over competitive reversers produced by others. The highly successful new concept fan-jet thrust reversers produced by The Dee Howard Company soon became standard equipment on a number of new business jet aircraft produced in the United States and internationally. The Dee Howard thrust reversers are still produced for new production fan-jet aircraft by the Nordam Company. The Lear Jet Mark II flight characteristic improvement, a noteworthy project developed jointly by Howard and James Raisbeck, improved the low-speed Learjet flight characteristics and short runway performance. The Learjet factory adopted the highly successful technology on new production aircraft. Howard became acquainted with Raisbeck when he was working on the Mark II development for the Learjet at the factory, and Howard was building thrust reversers for Gates Learjet. 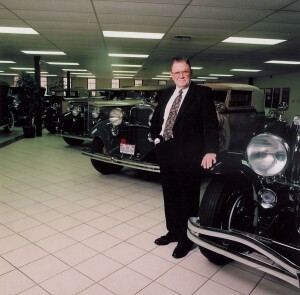 Dee Howard, in front of a few of the cars in his classic car collection. “Jim wasn’t making the progress that was expected. What he was doing to the Learjet to make it stall slower would also help it to perform better,” he explained. “We wanted him to be successful. 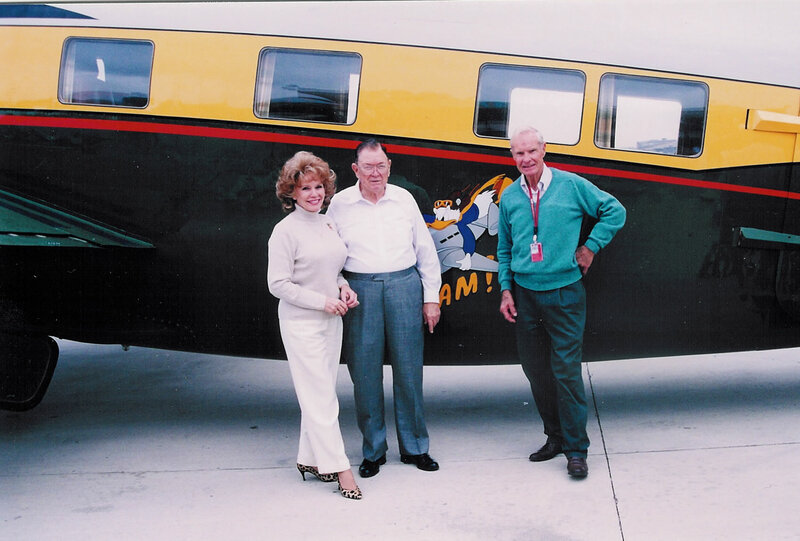 Finally, I made a deal with Harry Combs to bring the test airplane and Jim to San Antonio to finish the program. We just wanted to help Jim complete the terms of his agreement with them. We did it and Jim and I worked together and became great friends. The Dee Howard EX (Extended Range) Learjet Project was accomplished when Howard decided to do an extensive in-flight, air-dynamic drag study to advance the speed and range capabilities of the Lear Jet aircraft. Howard achieved his goal by extensive in-flight air-dynamic drag studies that were more effective than the Lear Jet wind tunnel test conducted by others. “The extended range mod on the Learjet was quite a deal,” he said. “We made a 23 percent improvement in the drag reduction on the airplane and the performance. The fan engines had just come in, and they were used on the Lear 35, but Learjet was still producing one made with the GE CJ610 and straight jet engines. The highly successful modification also advanced the XR Lear Jet performance by achieving extended range at mach .80, at a time when only the most efficient new swept-wing aircraft were able to achieve maximum range at such high speed. Significant projects included the extensive engineering and modification on a number of Boeing 747 aircraft for head-of-state customers. Howard’s first work of this type was engineering and modifying a Boeing 707 for Chiang Kai-shek. The hallmark accomplishment of this activity was a Boeing 747-300 for King Fahad of Saudi Arabia, which, according to Boeing Aircraft, was the largest, most extensively engineered and modified head-of-state aircraft ever accomplished. The aircraft still holds this record and is still in service in the royal fleet of Saudi Arabia. In the ceiling of each room of the aircraft, says Howard, is a Mecca indicator. Over the years, the Dee Howard Company had up to as many as 1,200 to 1,500 employees. In 1989, Howard sold his company to Italy’s Alenia Aerospace Group, which later sold the thrust reverser business to the Nordam Company. Dee Howard Aircraft Maintenance L.P. was formed in the summer of 1998, after a private investment company, Code, Hennessy & Simmons, acquired The Dee Howard Co.’s aircraft maintenance operations from Alenia. These days, Dee Howard Aircraft Maintenance continues a longstanding relationship with UPS, and counts Northwest Airlines, Hawaiian Airlines, America West, Boeing and Bax Global airplanes among their customers. Howard believes that his life has been endowed with a lot of wonderful things that happened because he “did something good” for one person or another. Among those wonderful things are several acknowledgements. He has been the recipient of a number of prestigious awards for achievement. In 1966, Howard received the FAA Aircraft Mechanics Safety Award, given for development of devices to improve aircraft safety. In 1988, he received the Queen’s Award from Great Britain for Technological Achievement for his contribution to the development of the Rolls Royce Tay Jet Aircraft Engine. He received the meritorious Service Award from NBAA for a lifetime of contributions to the advancement of aviation, in 1993, and the 1996 Master Entrepreneur of the Year Award in San Antonio, presented by Ernst and Young. A few years ago, Howard founded River City Products, after feeling a compelling need to improve highway safety by making heavy, over-the-road vehicles directionally stable and less fatiguing to drive. Howard discovered the primary reason for the lack of heavy vehicle directional stability that has been overlooked by the heavy vehicle design community. He has developed new technology that is destined to dramatically reduce heavy vehicle driving fatigue and improve highway safety. 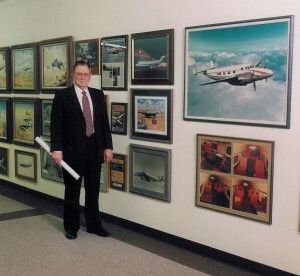 Howard has his own museum, at his office just west of the airport, where exhibits of past Howard accomplishments are displayed, as well as some of his vast art collection, including one of the largest representation of artwork by Douglas Ettridge as well as work by Mel Brown and others. A member of The Society of Automotive Engineers, he is also an avid classic car collector and consistent winner of classic car judging competitions for more than 30 years. And, Howard, who says he is living proof that if you have luck, “anything will do for brains,” has definitely been lucky in love as well. Howard and his wife Georgie had a blissful marriage that produced a daughter, Deanne, who served as Howard’s secretary for a number of years, and a son, Lonnie, who is presently retired. But Howard, now 82, was in for a pleasant surprise.